Former House of Representatives Speaker Dennis Hastert was indicted by federal prosecutors Thursday for allegedly lying to the FBI over $3.5 million in payments that he agreed to make in order to keep “prior misconduct” out of the public spotlight. Hastert, a former Republican lawmaker from Illinois, was charged in a two-count indictment with lying to investigators and withdrawing money in a way that kept banks from reporting his transactions to the government. Shortly after being indicted, Hastert resigned from his lobbying position at the Dickstein Shapiro firm, the Hill reported. If Hastert is found guilty, he faces up to five years in prison and a fine of up to $250,000 for each count, the Associated Press reported. The unsealed indictment does not identify the individual Hastert allegedly agreed to pay – referring to the person simply as “Individual A” – nor does it reveal what prior misconduct the former House speaker was trying to keep secret. It does say that the individual’s relationship with Hastert stretched back through most of his life, dating back to when Hastert was a teacher in Yorkville, Illinois. "During the 2010 meetings and subsequent discussions, Hastert agreed to provide Individual A $3.5 million in order to compensate for and conceal his prior misconduct against Individual A," the indictment reads, CNN reported. Between 2010 and 2014, Hastert had paid $1.7 million of the agreed-upon sum, according to the indictment. About $952,000 of that was withdrawn in a manner that was designed to avoid having banks report the transactions, since financial institutions must report withdrawals of $10,000 or more, the government claimed. Hastert was questioned by the FBI about his behavior in December 2014, but he allegedly lied to investigators and said he was withdrawing the cash because he did not trust the banking system. "Yeah ... I kept the cash. That's what I'm doing,” he reportedly said. 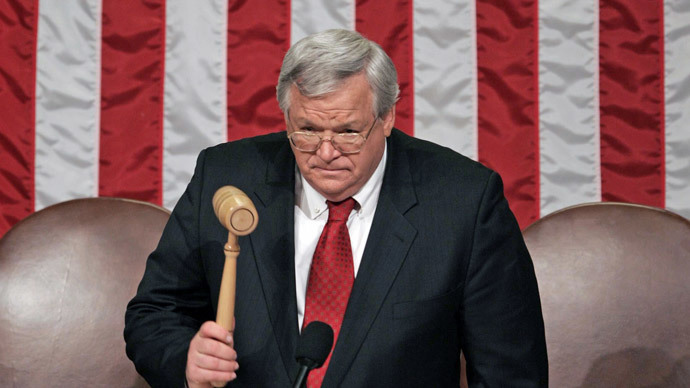 Hastert served as House speaker from 1999 – 2007, following the tenure of Newt Gingrich of Georgia. At eight years, he is still the longest serving GOP speaker in history.